All four members of the board of the government's Social Mobility Commission have stood down in protest at the lack of progress towards a "fairer Britain". 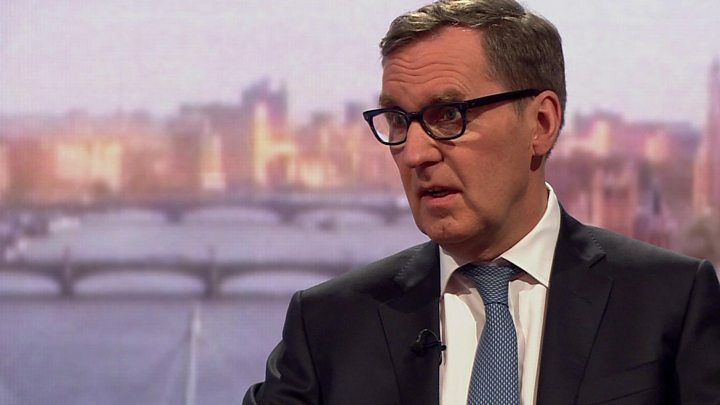 Ex-Labour minister Alan Milburn, who chairs the commission, said he had "little hope" the current government could make the "necessary" progress. The government was too focused on Brexit to deal with the issue, he said. The government said Mr Milburn's term had come to an end and it had already decided to get some "fresh blood" in. The commission is charged with monitoring the government's progress in "freeing children from poverty and ensuring everyone has the opportunity to fulfil their potential". In his resignation letter to Theresa May, published in The Observer, Mr Milburn said he did not doubt her "personal belief" in social justice, but he saw "little evidence of that being translated into meaningful action". He said individual ministers, such as the education secretary, had shown a deep commitment to social mobility. But it had "become obvious that the government as a whole is unable to commit the same level of support". Sour grapes? Political point scoring? Neither, according to the former Labour minister and his colleagues on the board who include a former Conservative education secretary. Their frustration demonstrates the extent to which Brexit is all-consuming for the government. Leaving the EU is taking up so much time, energy and effort that there is little capacity for anything else to get done. Even on an issue which is a personal priority for the prime minister. Mr Milburn, a former health secretary, took up his role at the commission in July 2012, under the coalition government led by David Cameron and Nick Clegg. Speaking on the BBC's Andrew Marr Show, he said divisions in Britain were becoming wider - pointing to the ongoing squeeze on wages. The government lacked the "bandwidth" to tackle social division while also dealing with Brexit, he said, describing his task as being like "pushing water uphill". Mr Milburn said Education Secretary Justine Greening had been a "champion for the cause" and had wanted him to stay in post - which Ms Greening, who also appeared on the show, would not be drawn on. "He has done a fantastic job, but his term had come to an end and I think it was about getting some fresh blood into the commission," she said. She denied the government lacked the will to tackle inequality, but admitted more needed to be done. In a report published last week, the commission said economic, social and local divisions laid bare by the Brexit vote needed to be addressed to prevent a rise in far right or hard left extremism. It said London and its commuter belt appeared to be a "different country" to coastal, rural and former industrial areas, with young people there facing lower pay and fewer top jobs. The resignations come as Mrs May, who entered Downing Street in July 2016 promising to tackle the "burning injustices" that hold back poorer people, faces questions over the future of senior minister Damian Green - who is effectively her second in command - and is under pressure as Brexit talks continue. In an interview in the Sunday Times, Mr Milburn said: "There has been indecision, dysfunctionality and a lack of leadership." The government said it was making "good progress" on social mobility and focusing on disadvantaged areas. It said it had already told Mr Milburn it planned to appoint a new chair and would hold an open application process for the role. It said it was committed to fighting injustice "and ensuring everyone has the opportunity to go as far as their talents will take them". It highlighted its increase of the national living wage, cuts in income tax for the lowest paid and doubling of free childcare in England. The process of appointing a new chairperson and commissioners would begin as soon as possible, it added. The other board members standing down include deputy chair of the commission and Tory former education secretary Baroness Shephard. Paul Gregg, a professor of economic and social policy at the University of Bath, and David Johnston, the chief executive of the Social Mobility Foundation charity, are also leaving. Shadow cabinet office minister Jon Trickett said the resignations came as "no surprise". "As inequality has grown under the Tories, social mobility has totally stalled," he said. "How well people do in life is still based on class background rather than on talent or effort." Mr Milburn said he would be setting up a new social mobility institute, independent of the government.